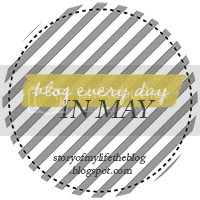 Surviving four kids! : My Three Sons - In ONE room! My Three Sons - In ONE room! Here we have one side of the boys wardrobe. The top rail is Mr 4's tops and PJ's, the bottom one of Mr 23 months. As you can see, I have crammed toys in where ever possible. 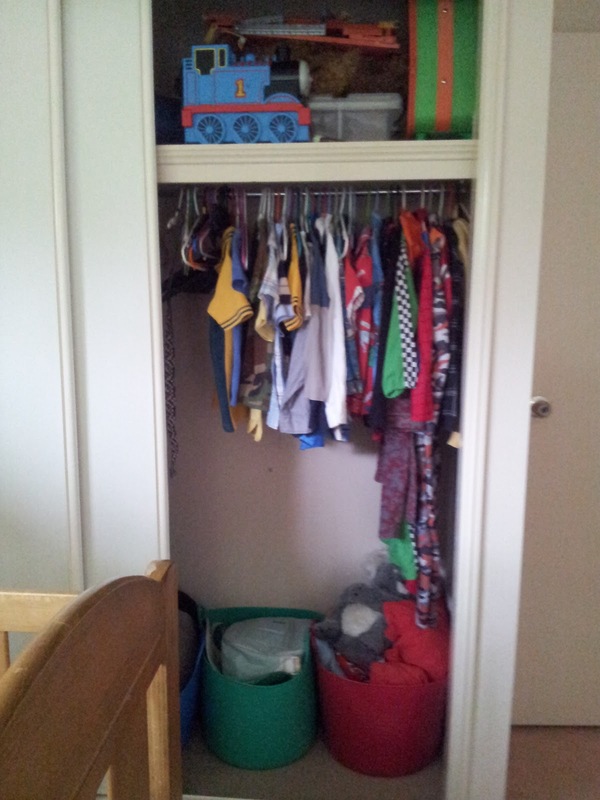 Top shelf is devoted to toys, and under Mr 23 months clothes, is where the 'larger' cars get stored. Note: I got the extra rail from Howards Storage World for $19.95. Not bad hey! All 3 boy's beds. Mr 23 months will be moving out of the cot, and into a big boy bed soon, and there is enough room for that too. Tall boys have a draw for each child. One has socks, jocks, singlets. The other chest has a draw each for shorts and pants. I put the pants away when its summer, shorts away when its winter ect. 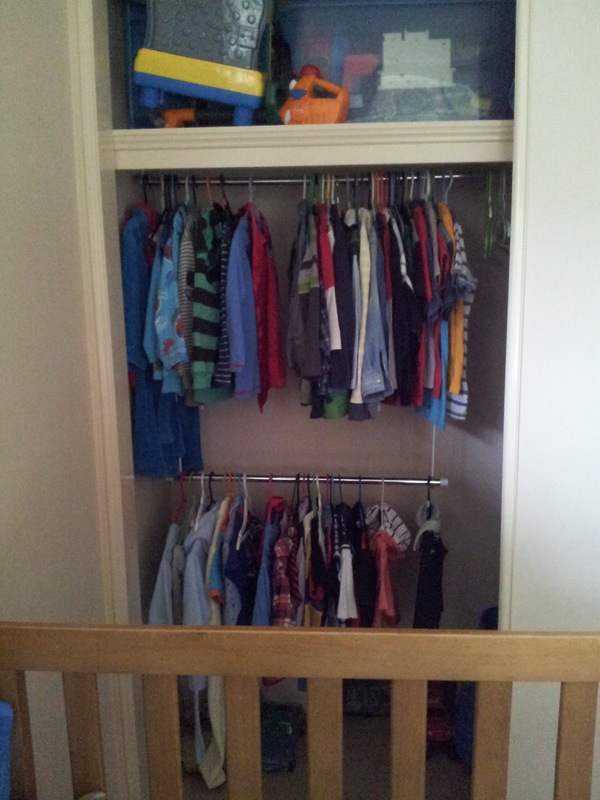 Finally we have Mr 5(nearly 6) side of the wardrobe. He has his Tops and PJ's and a few costumes in here. At the bottom, you can see I have 3 of those infamous tubs. They don't belong to any particular child, all extra toys get put in there, so it is easy for them to put away themselves. As you can see, it is simple, not fancy at all. But it does the job. Noone has complained ..... yet hehe. 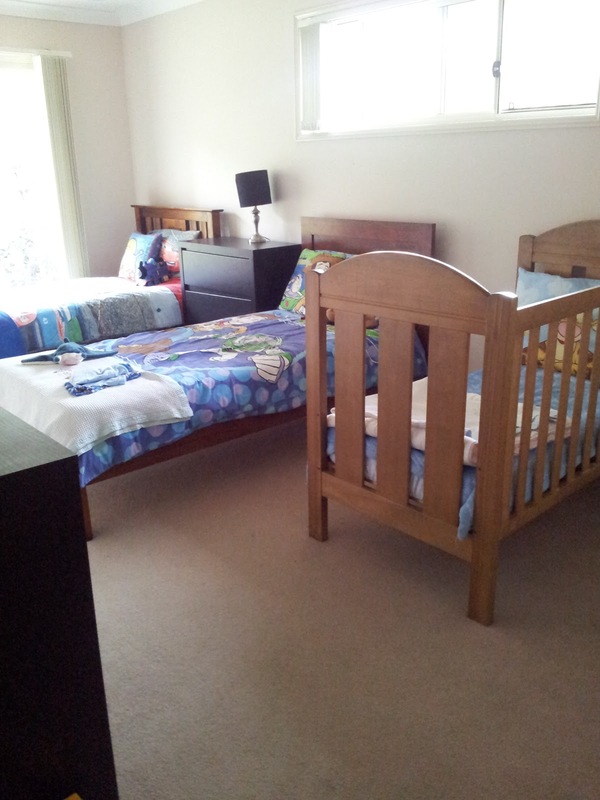 We too have 3 boys in one bedroom :) but 3 older boys aged 12,9 and 7. Mr 12 is about to move out into his own space again though so im in the midst of trying to figure that out, but the three boys in one space does work well most of the time because in our house I find they love all the same things etc. My latest blog post was about redoing their room for the 2 younger ones. School Station - All aboard! Peanut Butter and Banana Muffins! A new start, for ME!